Over the last few months, the security situation in the Central African Republic has deteriorated. Given its central location, the CAR remains a key puzzle piece in African. The current cycle of civil unrest holds especially large implications for neighboring countries Chad and Uganda and the region at large, as it sends massive waves of refugees to the surrounding countries. 2017 brought a surge in violence following the withdrawal of Ugandan forces from the country. Soon after, several major aid agencies and NGOs left the country, citing endemic violence, systemic displacement, and security risks. The withdrawal comes at a bad time, as the CAR needs aid now more than ever. Over half its population (2.2 million) currently needs some form of humanitarian assistance. Regardless of whether UN forces and the current government can put an end to the violence and address the humanitarian crisis, there are deep divisions that will continue to obstruct a sustainable political future for the country. If the CAR is to emerge from this bout of civil unrest to a better tomorrow, it will have to heal wounds and cleavages that fall directly along religious and ethnic lines. Conflict and political discontinuity in the CAR began after the overthrow of Colonel Jean-Bédel Bokassa, a megalomaniacal dictator who seized power in 1966, shortly after the country’s independence. Bokassa ruled until he was deposed with the help of French troops in 1979, setting off a long series of coups and failed democratic initiatives which ultimately culminated in a 2004 civil war. The civil war pitted the government of François Bozizé – who had consolidated power through a coup in 2003 – against the Union des Forces Démocratiques pour le Rassemblement (UFDR), which headed a vast number of rebel groups. A 2007 peace agreement brought hope but was never implemented in full, and in 2012 a coalition of northern rebel groups known as Séléka seized control of several towns near the Chad border before installing their leader, Michel Djotodia, in the CAR capital of Bangui. Djotodia became the first Muslim leader of the CAR, leading a coalition that accused Bozizé of favoring the Christian population at the expense of 15% of the population that identify as Muslim. In reaction to Djotodia’s rule, Christian militias formed anti-balakagroups which brutally attacked Muslim-majority villages. In 2013, the country exploded into bloodshed after the Sélékas overthrew Bozizé. In 2013, the African Union-led sent 5,000 ground troops from Gabon, Chad, the Republic of Congo and Cameroon into the CAR. The following year, these were subsumed into the United Nations Multidimensional Integrated Stabilisation Mission in the Central African Republica (MINUSCA), which doubled the number of the ground-troops, in addition to a supporting contingent of 1,820 police officers. MINUSCA’s official mission is to safeguard the implementation of a 2015 peace agreement between the government and ten of the most prominent rival armed groups. In February of 2016, Faustin-Archange Touadéra won the presidency on a platform based on religious reconciliation. However, the election still left the conflict in the CAR far from being resolved, particularly given the deep-seeded memories of ethnic and religiously-motivated bloodshed engrained in the minds of Central Africans. In 2016, the French officially ended their military operations in the CAR, partly due to international outrage over accusations of sexual violence against civilians in the CAR. In the CAR, French operations had been aimed at pushing out the Séléka alliance—a mission whose success was hamstrung by the multiplicity of the coalition’s rebel groups. France saw the CAR within a broader regional dimension given its critical borders with Sudan and Chad. In April of last year, Uganda also started withdrawing its troops involved in the US-backed missions against the Lords Resistance Army (LRA) in the CAR. The forces had been supported by 100 US Special Forces in intelligence gathering on LRA activities in CAR since 2010. The withdrawal, in tandem with France’s departure, became a contributing cause to the upsurge in violence starting in May of 2017. The UN, however, doubled down in the CAR and increased the size of its force to 14,000 troops. Questions remain regarding the force’s ability to stabilize the region, as the continued violence is causing unprecedented levels of internal and regional displacement. Meanwhile, MINUSCA forces have continually struggled to appropriately defend refugee camps and rural communities in the country. 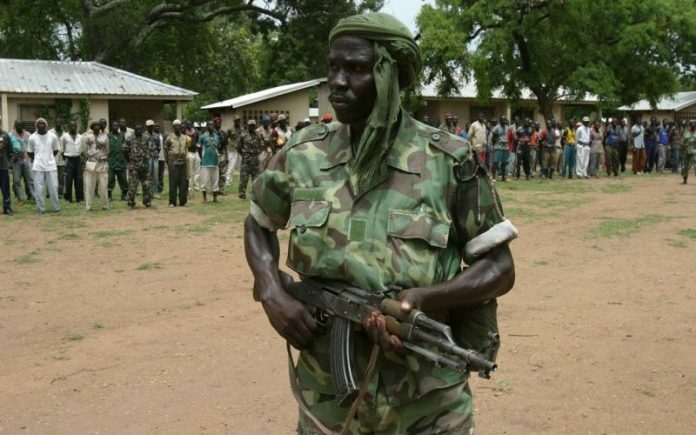 In May, the city of Bangassou was attacked by anti-balaka militias. Again, in August, several dozen people were massacred in a similar attack in Gambo. As the UNSC moves to increase its ground presence, its peacekeeping forces’ ability to pacify the local situation remains in question. While violence along sectarian lines may be on the decline, it is likely that inter-factional conflict within the Séléka alliance (which was forced out of the capital, Bangui, in 2014) will continue in the short-term. In recent months, the Union for Peace in the Central African Republic (UPC) of the Fulani ethnic group and the Popular Front for the Renaissance (FPRC), which is made of Gula and Runga fighters, have been battling for control of the Eastern Haute-Kotto and central Ouaka prefectures. As fighting continues in these prefectures, the de-facto partition between North and South and Sélékas and anti-balaka groups will give space for Christian armed groups to grow, which is a major concern for UN forces. Amidst these challenges, the future of UN operations is unclear. The extension of the mandate and recognition of recent shortcomings does not remove broader questions about what these forces will realistically be able to achieve. Meanwhile, CAR government forces have not demonstrated an ability to maintain control over the entirety of their territory. Further withdrawals may contribute to the formation of a dangerous vacuum which rebel groups will seek to fill. The CAR’s domestic conflicts have long had a broader regional and international dimension. France, the African Union, Uganda and Chad all have a history of military activity in the CAR, reflecting its strategic import within the region. Developments within the CAR will be keenly watched by its neighbors, especially as increased violence sends thousands of refugees to their doors. The road ahead for the CAR is arduous. As the country navigates uncertain political waters and struggles to quell the violence outside of the capital, international stakeholders move inevitably closer to giving up on their missions. While popular fatigue and opposition to the conflict have brought about a government based on a reconciliation platform, Bangui has not shown its ability to put forward a political agenda and architecture capable of disarming the various factions. The coming year will undoubtedly be decisive. If the government is able to reaffirm some form of control over key regions like Ouaka, the momentum could reasonably bring increased international attention and support. Otherwise, the CAR risks becoming an almost irreversibly failed state. Looking at the road ahead for the CAR, multiple scenarios can unfold. The first one is that the increase in numbers in UN and international forces is sufficient to bring security to the critical regions in the center and north-east of the country, deterring ethnic militias from combat and winning the hearts and minds of the local population. However, this is unlikely. The withdrawal of French troops shows now more than ever that the momentum behind international missions, including MINUSCA, is wavering at a member-state level. Furthermore, the challenges on the ground and ineffectiveness shown at times by the UN forces has negatively impacted their credibility in the country. More pessimistically, reconciliation may ultimately fail even at a level, leading to more divisive leadership platforms and the establishment of a partisan administration in Bangui. The current leadership needs to show results, fast, and absent those may face near-term political challenges by new contenders wishing to take a different approach than Touadéra. Finally, the more likely near-term outcome is an unfortunate political status quo. As religious conflict further degenerates into localized fighting among ethnically-defined groups, the disconnect between Bangui and the rest of the country will persist, with the UN acting as a somewhat effective buffer between civilians in urban centers.